Each and every hunter knows that a hunting knife that is high in quality is his most dependable companion out of doors. Apart from taking down prey and dressing the game, one can also use it for a number of purposes. You can chop and cut tree branches with it, perform emergency repairs on certain gear, and perform a number of tasks around the campsite with the help of a good knife. Due to the overwhelming amount of hunting knives on display today, it can be a pain choosing one that will suit your needs. Do not worry, though; as long as you have a clear idea of what kind of game you plan on hunting and you are quite familiar with your needs, you will simply breeze through the selections. To make the job easier, we have a slew of reviews for you to read for reference. 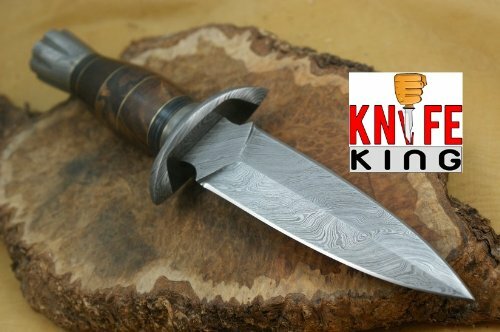 In this review, we are going to tackle the workings of Knife King’s Janus Handmade Hunting Knife. If you want to get a knife that will last you for life, you have to first take into consideration some factors. You have to know the purpose of employing said knife; how do you intend on using the hunting knife? Do you plan on only doing one activity with it or want something that can tackle a few more? You have to be specific and objective when it comes to this subject, since you need something that will do what you expect it to do. Then you have to think about the size. The size of the blade can benefit certain activities out of doors, but hunting is more specific though; more often than not, hunters are not required to carry bigger knives, since most mainly use the implement for tackling game. If you plan on managing bigger game, you will need a hunting knife with a blade length of 5-7 inches but no longer than 8 inches, which can be too much. However, if you plan on dealing with smaller game, you can opt for knives with a blade length of 2-5 inches. Of course you still have to contend with your personal preferences, thus it is more recommended that you go with what you really want. Then we have to factor in ergonomics; the knife must feel good in your hand and it should not slip around while dressing or cutting game. It should also stay put while in use during wet conditions. When it comes to Knife King’s Janus model, this one rates highly in our book. It has top quality materials and structure. It has a handle with a bigger diameter with a significantly ergonomic bulb. The metal and wooden segments of the knife are sanded to a smooth finish and it really induces an organic feel as you hold the item. Feeling is believing, since compared to just seeing the item in a picture, by holding it you will notice that the blade and the guard are bigger and fuller than they seem to be. This one is a tough model and it impressed me the way it made a positive impact on its satisfied customers. Users also agreed that the item sharpened easily, with the blade having a solid quality and has a distinct sharpness that comes straight out of the package. It has a quality leather sheath as well with a good fit, excellent stitching, and first-rate leather material. The Janus has its fans, but there were also a few unsatisfied customers. One complained that he noticed the knife was not full tang. Another complained that the handle was not assembled well. According to one customer, the knife did not fit properly into the “free size” sheath; the knife refuses to remain in position when the user carries the item on his belt. For this, the customer suggests a clasp or strap for the handle at the belt loop. TheKnife King Janus is overall a heavy, well-designed, and structured knife that should be included in your gear. It’s a knife built with superior quality, and a real looker at that. What Makes A Good Hunting Backpack? Some recommended products may use affiliate links. ProHuntingKnife.com is a participant in the Amazon Services LLC Associates Program, an affiliate advertising program designed to provide a means for sites to earn advertising fees by advertising and linking to Amazon.com. Amazon and the Amazon logo are trademarks of Amazon.com, Inc or its affiliates. Copyright © 2017 - 2019 ProHunting Knife | All Rights Reserved.